It is much more difficult to find IO modules than on the old website. I would prefer the ability to choose AI, AO, DI, DO, Serial, Other and drill down from there. It would also be nice if the filter results loaded with AJAX, instead of reloading the whole page - If you need to check multiple filter boxes, you have to expand, click, wait for reload, scroll, expand, click, wait for reload - it gets annoying. @philip Is this in reference to the SNAP configurator or the EPIC one? Regarding the product selector, I will ensure your feedback is sent to the web team. Both of them - I was using them last night to compare different options for a customer. I ended up pasting the results into Excel. Also - be nice if the pricing was listed on the configurator. 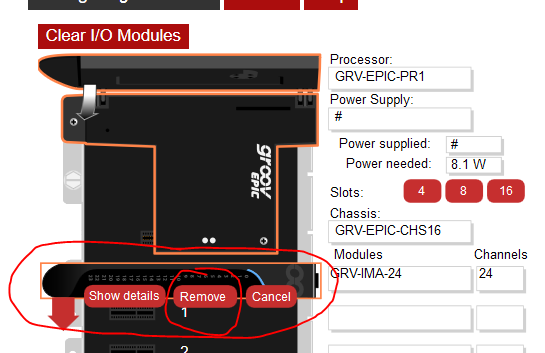 Just on the remove all… Did you notice that if you click on the module on the rack, you get a remove option?